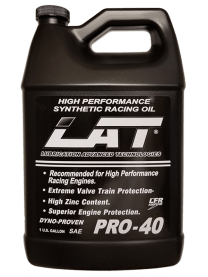 LAT Synthetic Pro 40 Racing Oils are blended for maximum horsepower engines that require added protection for valve train, ring seal vacuum, and maximum film strength for all bearing surfaces. LAT uses the highest quality group VI and V based oils in the industry. 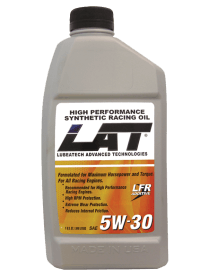 Our Exclusive LFR additives provides exceptional high RPM protection by substantially reducing friction, scuffing, and galling while reducing engine temperatures. PAO and Esters Synthetic based oils actually increase horsepower and torque as much as 6%. Available in 1 gallon, 4 gallon bottles per case, and a 5 gallon pail. LAT Synthetic Racing Oils are blended for maximum horsepower engines that require added protection for valve train, ring seal vacuum, and maximum film strength for all bearing surfaces. LAT uses the highest quality group VI and V based oils in the industry. Our Exclusive LFR additives provides exceptional high RPM protection by substantially reducing friction, scuffing, and galling while reducing engine temperatures. PAO and Esters Synthetic based oils actually increase horsepower and torque as much as 6%. Available in 12 quart case and 55 gallon drums. 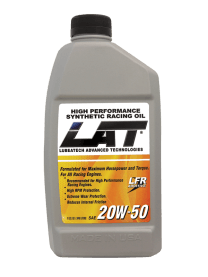 LAT Synthetic Racing Oils are blended for maximum horsepower engines that require added protection for valve train, ring seal vacuum, and maximum film strength for all bearing surfaces. LAT uses the highest quality group VI and V based oils in the industry. Our Exclusive LFR additives provides exceptional high RPM protection by substantially reducing friction, scuffing, and galling while reducing engine temperatures. PAO and Esters Synthetic based oils actually increase horsepower and torque as much as 6%. Available in 1 quart bottles and 55 gallon drums.